When R first came out, around the year 2000, I was really excited. Here was a powerful, programmable statistical package that was free to anyone. I thought “This could revolutionize data analysis.” But when I gave it a test run, I quickly got discouraged. All the routine data management tasks seemed much harder in R than in SAS or Stata, my go-to statistical packages. And many of my favorite analytical tools (like Cox regression) that were readily available in commercial packages seemed to be missing from R. Plus, everything was formulated in terms of vectors and matrices, and I knew that wouldn’t fly with the sociology graduate students I was teaching. So I put R back on the shelf and let others play with this shiny new toy. Fast forward 20 years and things have changed dramatically. It now seems that no matter what you want to do in statistics, there’s an R package for that. Slick interface apps like RStudio have streamlined most of the routine tasks of managing R itself. And meta-packages like the tidyverse have made data management and manipulation much easier and more straightforward. 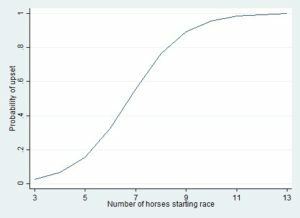 The most striking feature of this graph is the overall dominance of SPSS. However, SPSS peaked in 2009 and has since suffered a massive decline. SAS has also declined greatly since 2010, and it is now below R (the orange triangles) which has been steadily increasing in scholarly mentions since its inception. It’s now much easier to get answers to any kind of R question, either by a quick web search or by just asking someone who works nearby. You can readily communicate your program code to hundreds of thousands of other researchers, without worrying about whether they have the same software installed. It’s this second point that I want to stress here. I’ve come to the conclusion that R should be every data analyst’s second language. To me, it’s like English. No matter what your native language, it’s extremely useful to have English as a second language so that you can communicate easily with others who don’t share your native tongue. And so it is with R.
I’ve certainly found that to be true in my own work. Although I’m far from being a skilled R programmer, I’ve recently developed enough familiarity and competence with R that I can translate nearly all of my teaching examples and exercises into R. Currently, I try to provide R code for all the seminars I teach for Statistical Horizons. My two most recent publications have included R code. And I can now do a much better job of reading and reviewing papers that include R code. R also enables me to do some things that I can’t do in SAS or Stata. For example, R can do multiple imputation for clustered data using either the jomo package or the mice package. And for linear structural equation modeling, I prefer the lavaan package over what’s in SAS or Stata (but Mplus is still better). More and more people who come to Statistical Horizons seminars prefer to work in R, and they really appreciate having R code. Increasingly, our new instructors also prefer to teach their courses using R. Of course, that’s mainly a cohort phenomenon. 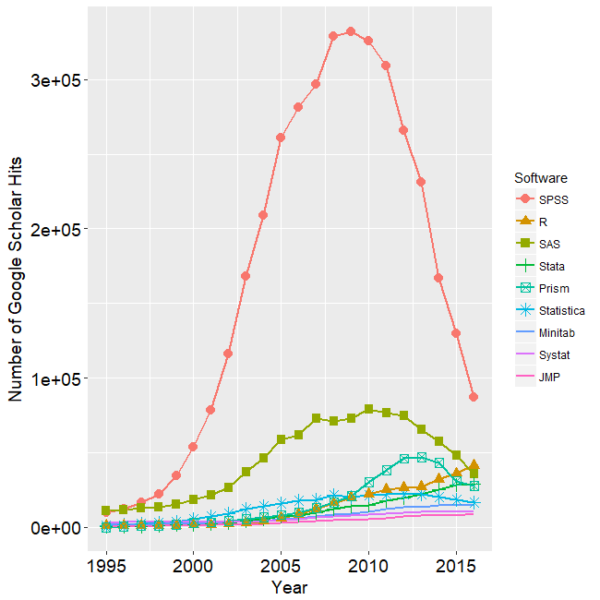 Statistics departments overwhelmingly prefer to teach with R, at both the undergraduate and graduate levels, so there are thousands of newly-minted R users every year. Don’t get me wrong, there are still lots of things I don’t like about R. There are so many user-contributed R packages that it’s hard to figure out which one will do what you want. And because there will often be many packages that will do you want, you then have the problem of figuring out which one is best. Documentation for many packages is sparse or poorly written. Even more bothersome is that some packages conflict with other packages because they have functions (or other elements) that share the same names. That can cause serious headaches. Despite those problems, I am confident that R has a bright future. There are even newer competitors (like Python) that are favored in the data science/machine learning community. But R has reached such a critical mass that it will be very hard to stop. How do you go about learning R? Well, there are lots of good materials on the web. But I think the best way is to take our seminar Statistics with R taught by Professor Andrew Miles. It’s designed for people who are reasonably proficient in statistics and already familiar with another package (like SPSS, SAS or Stata), but who just want to learn how to do those same things in R. In two days, you’ll get comfortable enough with R to do most of the statistical tasks that you are already doing in other packages. Andrew’s course also has lots of hands-on exercises, something that’s essential for deep learning of any new tool. You can get more information about his course here. When I teach courses on structural equation modeling (SEM), I tell my students that any model with instrumental variables can be estimated in the SEM framework. Then I present a classic example of simultaneous causation in which X affects Y, and Y also affects X. 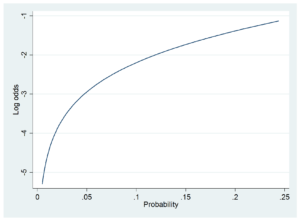 Models like this can be estimated if each of the two variables also has an instrumental variable—a variable that affects it but not the other variable. Specification of the model is fairly straightforward in any SEM package. However, there are lots of other uses of instrumental variables. My claim that they can all be estimated with SEM is more speculative than I usually care to admit. A couple weeks ago I got a question about instrumental variables in SEM that really had me stumped. What seemed like the right way to do it was giving the wrong answer—at least not the answer produced by all the standard econometric methods, like two-stage least squares (2SLS) or the generalized method of moments (GMM). When I finally hit on the solution, I figured that others might benefit from what I had learned. Hence, this blog post. The question came from Steven Utke, an assistant professor of accounting at the University of Connecticut. Steve was trying to replicate a famous study by David Card (1995) that attempted to estimate the causal effect of education on wages by using proximity to college as an instrumental variable. Steve was able to replicate Card’s 2SLS analysis, but he couldn’t get an SEM model to produce similar results. For didactic purposes, I’m going to greatly simplify Card’s analysis by excluding a lot of variables that are not essential for the example. I’ll use Stata for the analysis, but equivalent SAS code can be found in Addendum 2. Let’s begin with a bivariate regression of the log of hourly wages on years of education, for a sample of 3,010 young men in 1976. Education has a highly significant coefficient, whose magnitude can be interpreted as follows: each additional year of schooling is associated with about a 5% increase in wages. Of course, the problem with treating this as a causal effect is that there are likely to be many omitted variables that affect both education and wages. We could control for those variables by measuring them and including them in the model (and Card did that for many variables). But there’s no way we can control for all the possible confounding variables, especially because some variables are difficult to measure (e.g., ability). We must therefore conclude that education is correlated with the error term in the regression (a form of endogeneity), and that our regression coefficient is therefore biased to an unknown degree. Card proposed to solve this problem by introducing proximity to college as an instrumental variable. Specifically, nearc4 was a dummy (indicator) variable for whether or not the person was raised in a local labor market that included a four-year college. As with any instrumental variable, the crucial assumption was that nearc4 would affect years of schooling but would NOT directly affect lwage. Although there may be reasons to doubt that assumption (some discussed by Card), they are not relevant to our discussion here. Remarkably, the coefficient for education in this regression is more than three times as large as in the bivariate regression and is still highly significant. According to this estimate, each additional year of schooling yields a 21% increase in wages (calculated as 100(exp(.188)-1), a very large effect by any reasonable standard. (Card got a coefficient of around .14 with other predictors in the model). This can’t be right, however, because the coefficient for educ is identical to what we got in our initial bivariate regression, with an almost identical standard error. Clearly, the inclusion of the regression of educ on nearc4 has accomplished nothing. Can this problem be fixed, and if so, how? Now the coefficient and standard error for educ are identical to what we saw earlier with 2SLS. Problem solved! (SEM won’t always give identical results to 2SLS, as I explain in Addendum 1). Interestingly, the estimated correlation between the error terms (not shown in the table) was -.66. That means that the collective impact of omitted variables is to affect educ and lwage in opposite directions. Whatever raises lwage lowers educ, and vice versa. It’s hard to imagine what variables would behave like this. And that difficulty raises questions about the plausibility of the model. (Card suggested that measurement error in education could produce a negative correlation, but the degree of error would have to be unreasonably large to produce the result we just saw.) In any case, that’s not really our concern here. It does point out, however, that one of the advantages of the SEM approach is that you get an estimate of the error correlation—something you typically don’t see with 2SLS. What’s the lesson here? 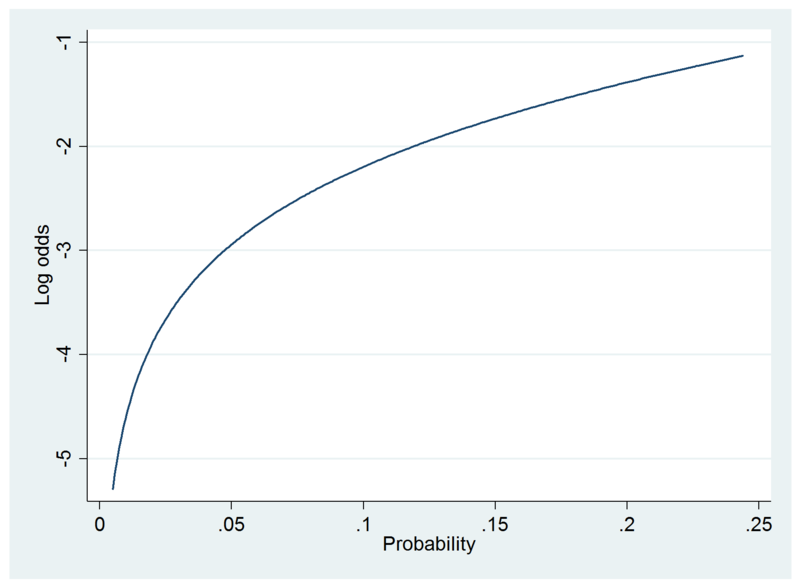 If you want to use SEM to estimate an instrumental variable model, it’s essential to think carefully about why you need instruments in the first place. You should make sure that the specified model reflects all your beliefs about the causal mechanism. In particular, if you suspect that error terms are correlated with observed variables, those correlations must be built into the model. If you’d like to learn more about structural equation modeling, check out my SEM short courses, which come in 2-day and 5-day versions. You can find links to past and future offerings here. 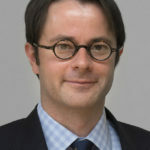 You might also be interested in Felix Elwert’s 2-day course on Instrumental Variables. His past and future offerings can be found here. Card, David (1995) “Using geographic variation in college proximity to estimate the return to schooling.” Aspects of Labour Economics: Essays in Honour of John Vanderkamp. University of Toronto Press. The reason 2SLS and SEM produce identical coefficient estimates for this example is that the model is just-identified. That is, the model imposes no restrictions on the variances and covariances of the variables. Other instrumental variable methods like limited information maximum likelihood or GMM also yield identical results in the just-identified situation. For models that are over-identified (for example, if there are two instrumental variables instead of just one), these methods will all yield somewhat different results.